View comments submitted by public here. 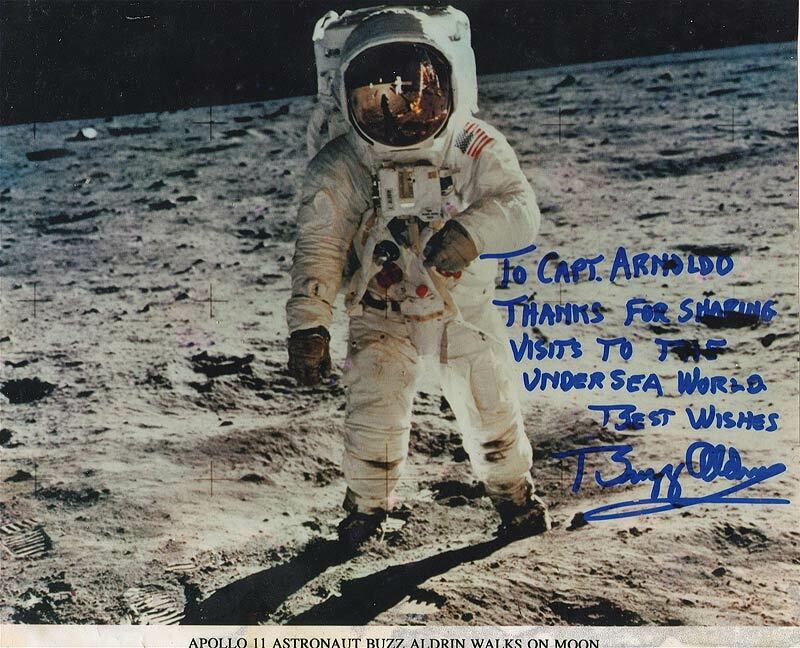 Buzz Aldrin visited St Thomas for two consecutive years in the early eighties to attend NOAA (National Oceanic and Atmospheric Administ.) conventions. He and other attendees took time to get some diving in. 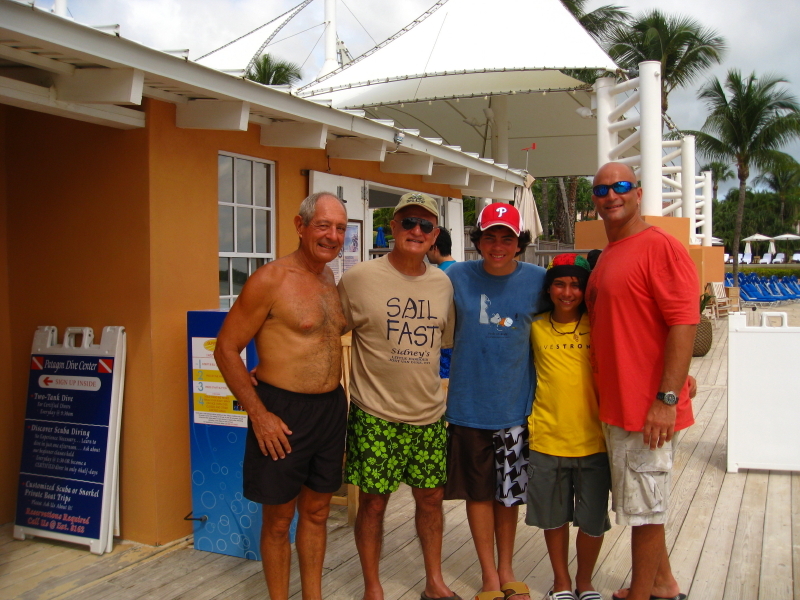 Arnoldo had the honor to be their SCUBA guide during those two visits. What a humble experience it was to meet Buzz, one of the biggest names ever in the history of human exploration and yet, his personality, so low key and unassuming. 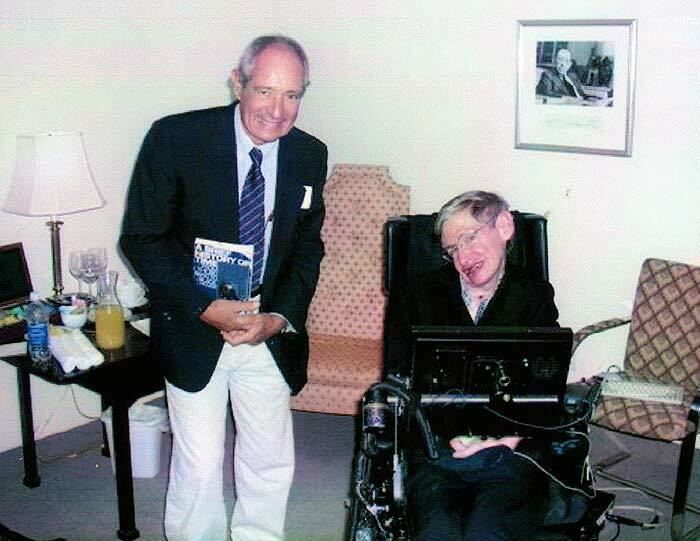 This photo was taken in a ca-merino of the Opera House of Cleveland after professor Hawking gave a public lecture. It was the closing event for a Conference on Cosmology held at Case Western University in 2005. 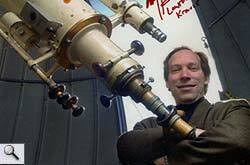 Lawrence Krauss was the host/organizer, and the chair for Case Physics Department at the time. Diver friend of Arnoldo, Lawrence invited him to attend. 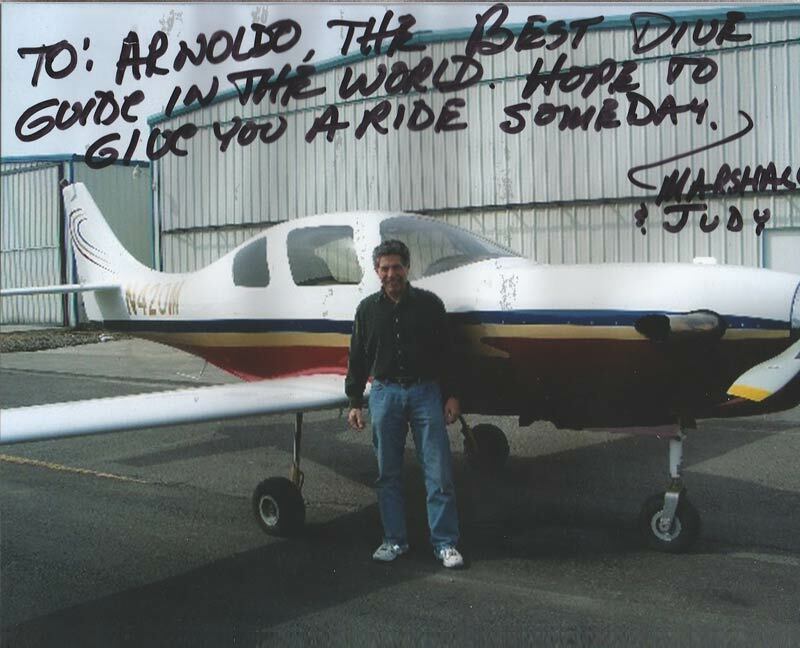 Somehow Arnoldo found a wealthy individual who donated his private jet to privately fly Professor Hawking and his team to the Conference. 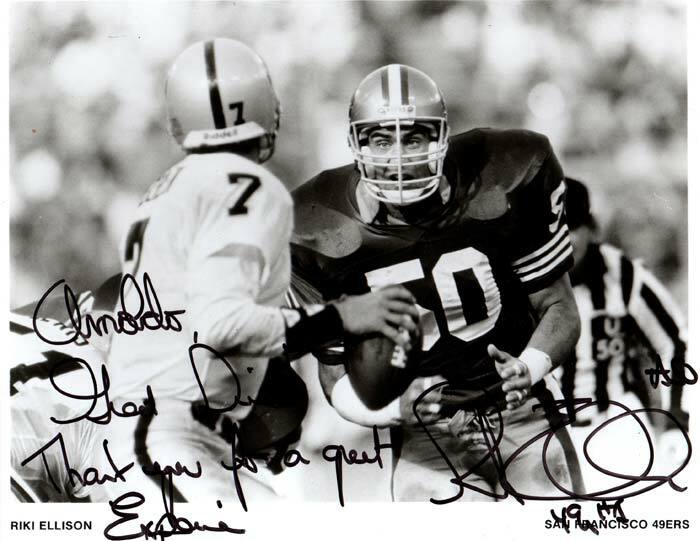 This certainly was a high honor to meet him in person. A well renown theoretical physicist, Lawrence made contributions to the understanding of the nature of dark matter, and for predicting an ever "accelerating" expanding Universe. The evidence (measuring light emitted by different supernovas over cosmic times) of this acceleration was presented on that Cleveland Conference in 2005. Scientists involved in that research obtained the Nobel Price in 2011. Lawrence is also a prolific science writer. His latest work "A Universe from Nothing" certainly created quite a steer. 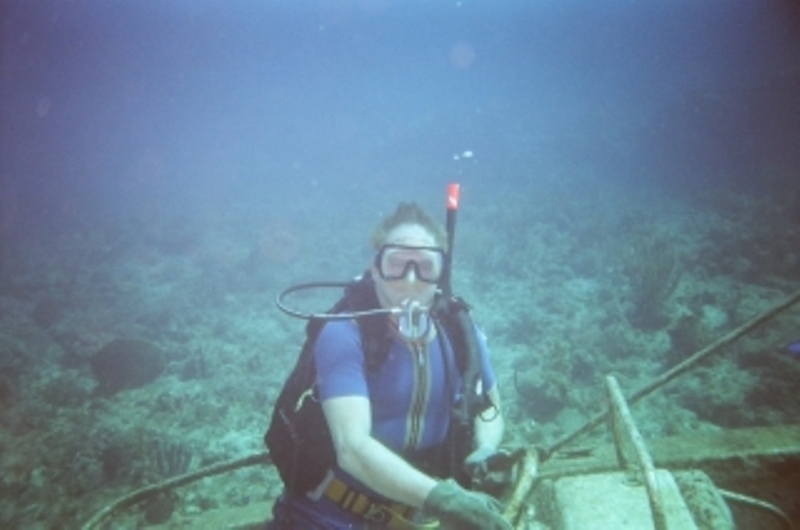 Lawrence got Open Water certified with Patagon Dive Center in 2003. 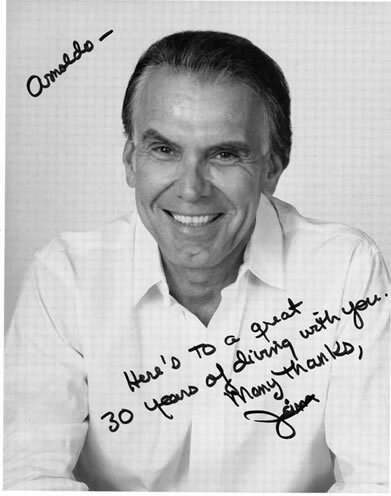 Arnoldo treasures his friendship since those days. In 2006 Lawrence Krauss hosted a physics work shop in St Thomas. The title: "Confronting Gravity", one of the most enigmatic forces of the Universe but taken so much for granted in our daily lives. Many prestigious names attended. Among them were Stephen Hawking, Lawrence Krauss, Alan Guth, Kip Thorne, Lisa Randall, P James Peebles, and Nobel Price Laureates Frank Wilczek, David Gross, and Gerard tHooft. 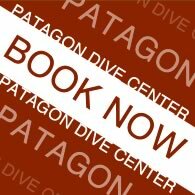 Patagon Dive Center had the privilege to take a great number of them SCUBA Diving. With pride we can say that our dive boat, "Lady Grace", held more brain power at once than any time any where before! Also we had the privilege to arrange for Stephen Hawking to have an VIP Atlantis Submarine underwater tour. 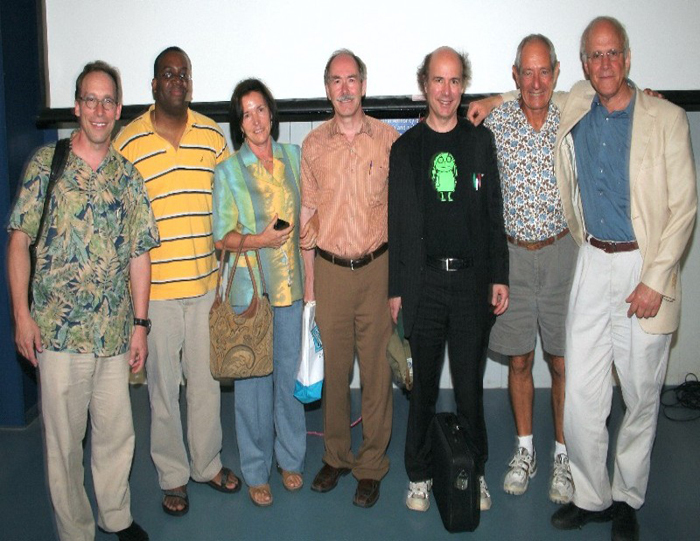 Lawrence Krauss, next to him a local physicist (sorry we do not have his name), Graciela, Gerard tHooft, Frank Wilczek, Arnoldo, and David Gross at Antilles School Auditorium where they generously offered a lecture for all the High Schools of St Thomas. 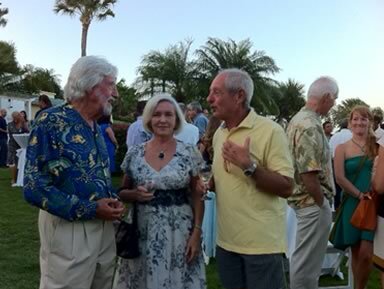 Graciela and Arnoldo chatting with Jean-Michel Cousteau at the Ritz Carlton, St Thomas, during the Opening of his "The Ambassadors of the Environment" program. This commendable program aims to educate youngsters (who vacation at The Ritz Carlton, St Thomas) on the protection of the Environment through a diversity of interactive activities, both at Sea and on Land. 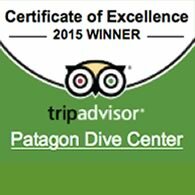 Patagon Dive Center is proud to be sponsored by The Ambassadors of the Environment when it comes to SCUBA diving. 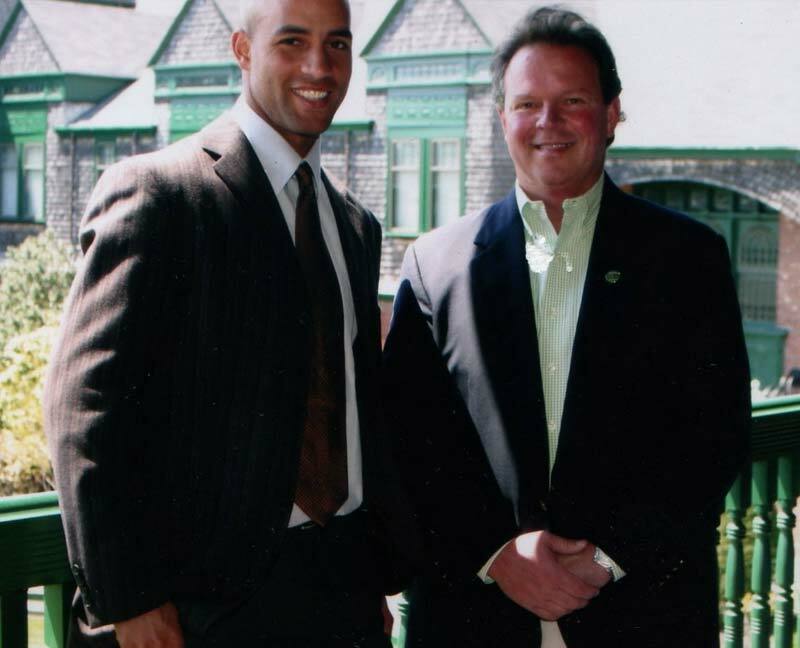 Arnoldo receiving a personal tour from Dr. Richard Murphy of the facilities of the Ambassados of the Environment, at The Ritz Carlton, St Thomas. Dr. Murphy, now the director of the program, had a very ilustrious diving career with many years as the chief scientist aboard the Cousteau's research vessel "Calypso". 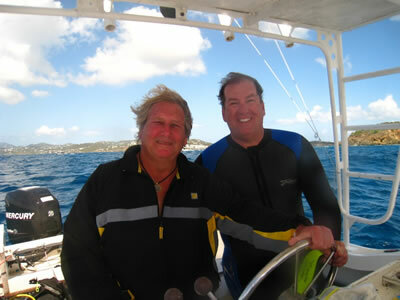 Arnoldo had the pleasure to host Dr. Murphy on numerous dives around the waters of the Virgin Islands. Jon exposes the stupidity, the ignorance, and the intolerance that is so often out there with his finest humor. He, most certainly, became an important factor for positive change in our modern society, and a leader for the Cause of Reason. 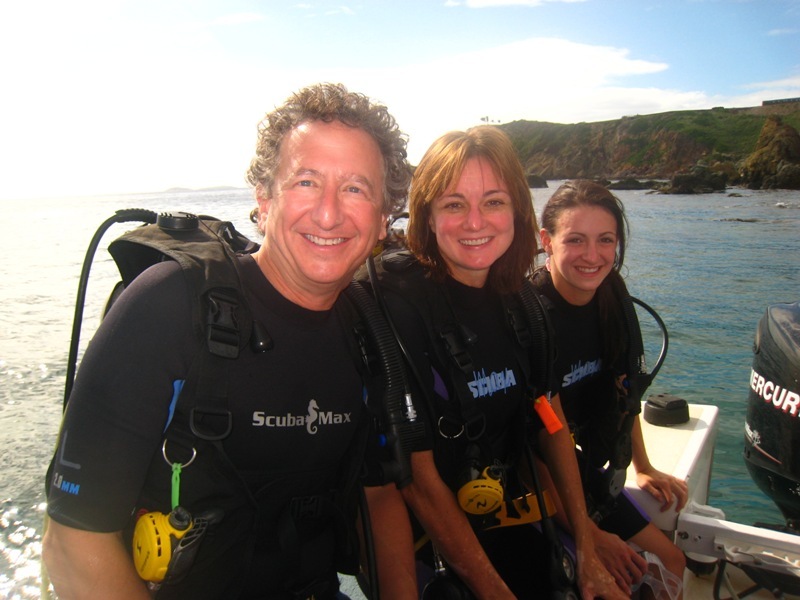 Arnoldo is so proud to have him and his wife Tracy as his regular guests divers. Tiger learnt to dive with Patagon Dive Center many years ago. His short trip to the Islands only allowed for just one beginner dive. But, more important, Arnoldo planted the seed on him for the love for free diving. These days Tiger is an accomplished free diver. 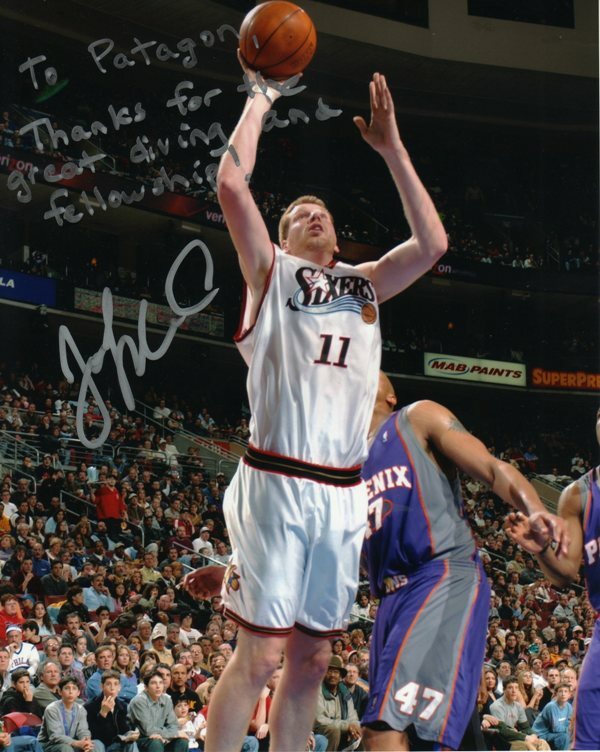 He practices the sport regularly out of his private Yacht with comfortably reach depths of 90/100 feet. 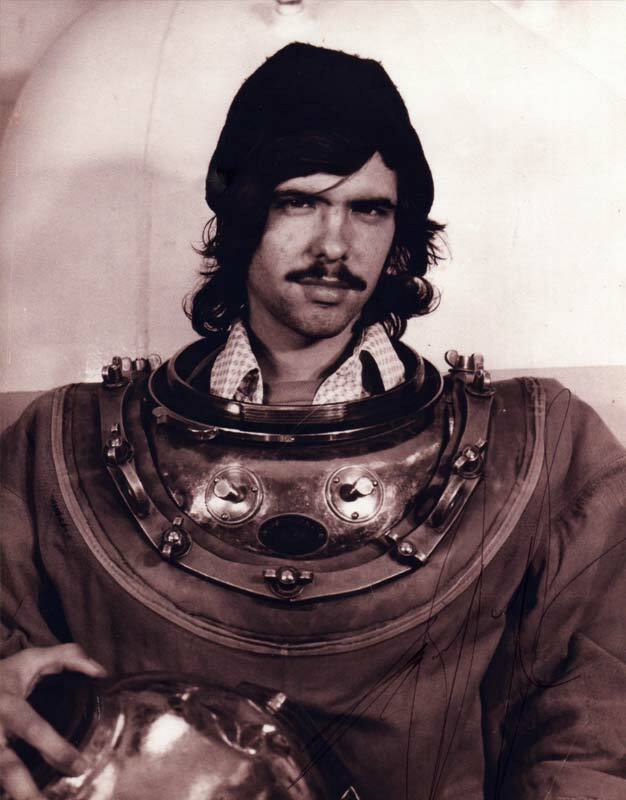 An old photo from the seventies showing Dave Weisher into his "hard hat" diving suit. 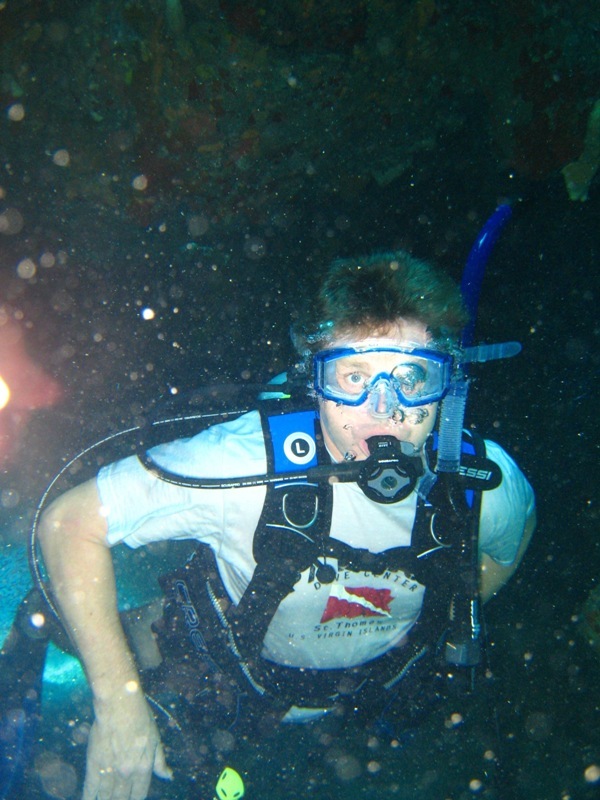 Dave's commercial diving jobs helped him to finance his studies for a degree in Medicine. 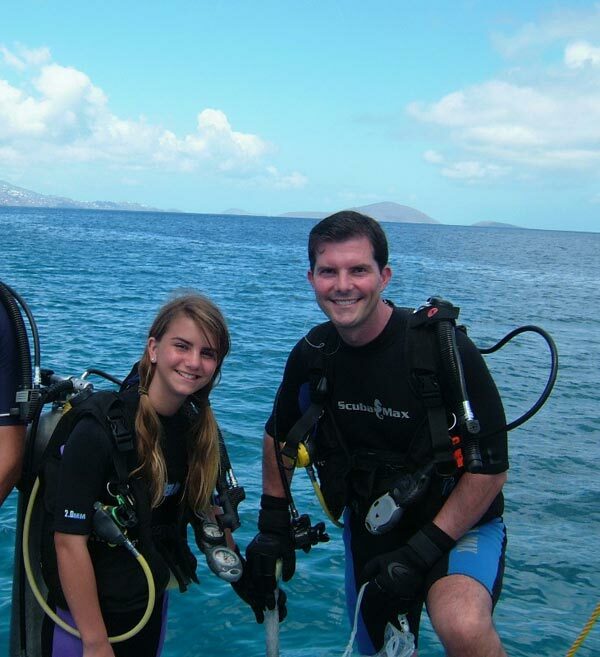 A neurologist, Dave runs his private practice in Saint Thomas and, as an expert in diving medicine; he is also in charge of the decompression chamber at our local Hospital. 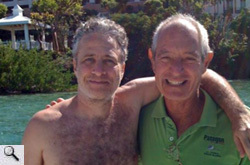 Dear friend Bob Fishman grew up in St Thomas and is an acomplished diver. 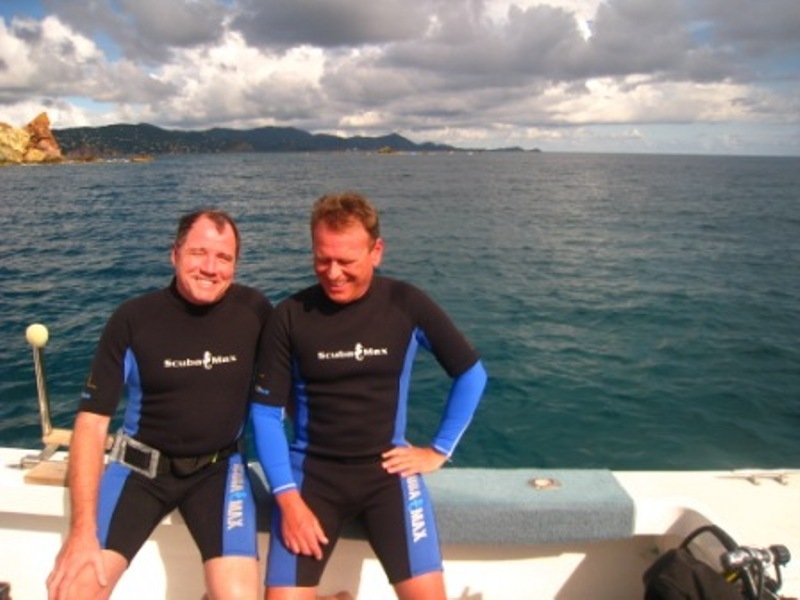 Every year we look forward to dive with Bob again during his family visit to St Thomas. 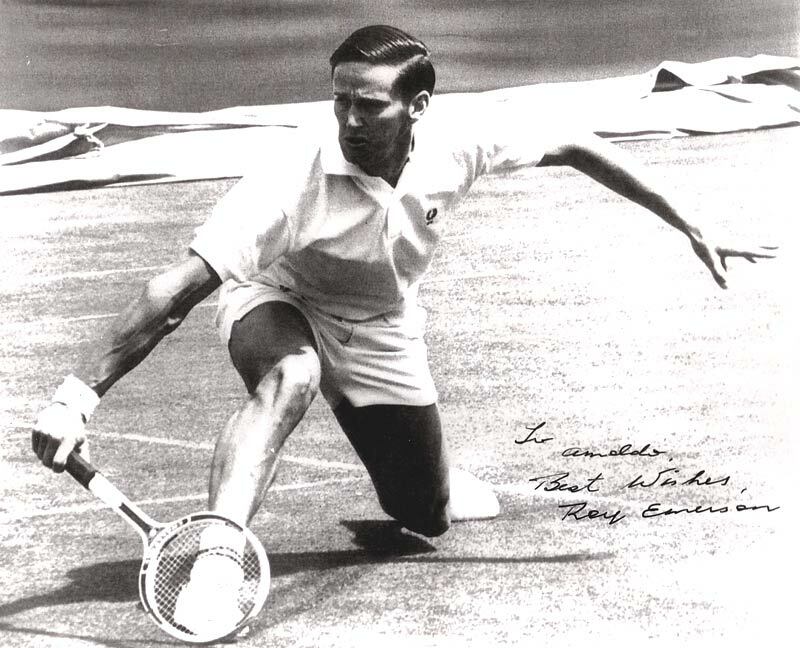 Bob is the Sports Director at CBS and, among others sports events, responsible for the TV coverage of the US Open Tennis in New York. 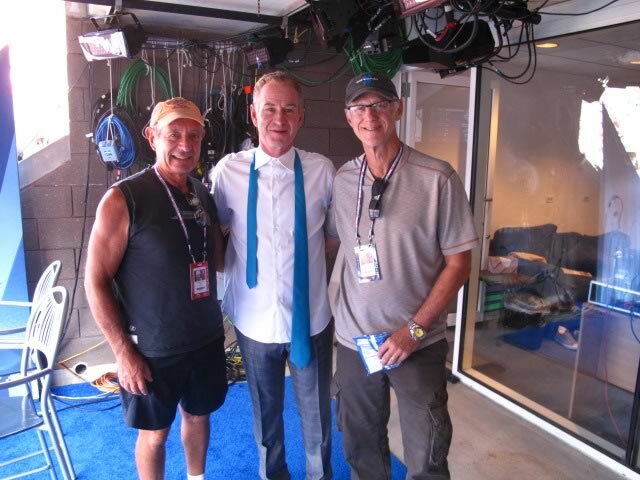 At the Arthur Ashe stadium's CBS suite, Arnoldo had the great pleasure to have a photo with Bob Fishman and John Mac Enroe. Johnnie Mac was getting ready for his next comentator job: The match between Federer and Verdazco during the US Open 2012. 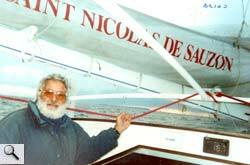 Bruno Nicoletti, a diver and sailor extraordinaire. Bruno's photo was taken by his brother Pino as they were sailing pass by Cape Horn. They were about to complete their nonstop circumnavigation around the World through the roughest waters in the world, the "Roaring Forties". Bruno and Pino made the trip, Puerto Madryn/Puerto Madryn, on a production series sailboat, a Catana 48. 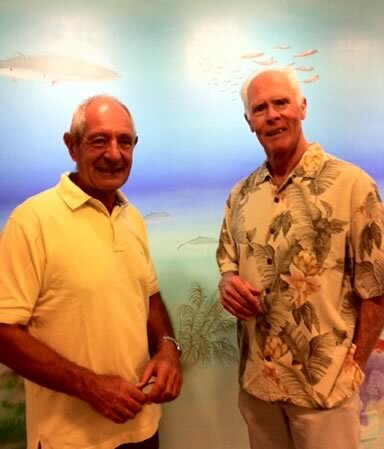 Arnoldo first met Bruno (a renown diver then) back in the late 60's and to these days he treasures his friendship and his source of inspiration in the love of the Ocean. Liza was one of our best Open Water students of 2007. Not only she got top grades for all her PADI academics but also she performed so well in all her confined water skills sessions and open water dives. More remarkable, Liza overcame her initial apprehension to the new underwater environment extremely well. We look forward to see her next year. As an electronic enginer Bill got involved in a very successful venture for the computer-communications industry. 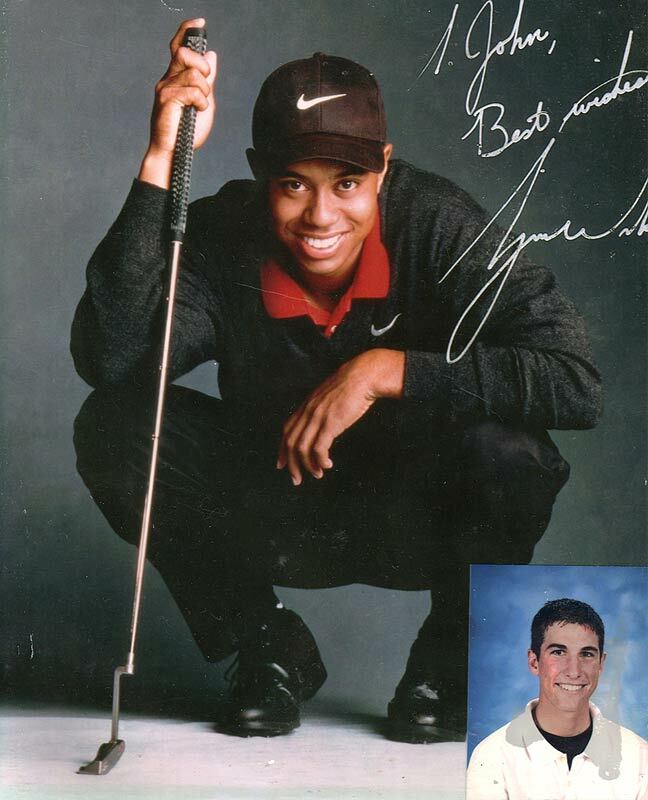 He was able to retired at very early age. SCUBA is one of the many activities he fills his free time with. Bill is always jovial and with almost a permanent smile on his face. Even underwater that smile is present as we see him exiting from a narrow swim thru at "The Strugglers" site. 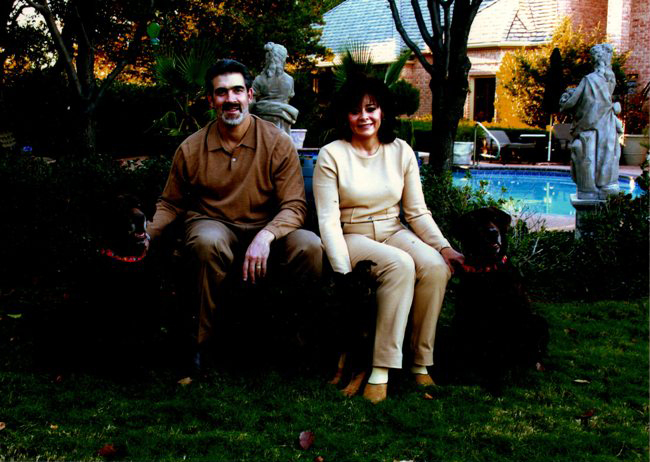 The Brandeckers Ed and Roberta Brandecker are both physicians and own a Orthopedic practice in Texas. They've got PADI open water certified with Patagon Dive Center in 1999 and became very active divers regular St Thomas visitors ever since. 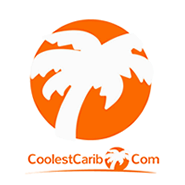 More recently they divide their diving vacations between St Thomas and Belice where they bought property. At Patagon Dive Center we are always looking forward to see them again, even if not as often as in the past. 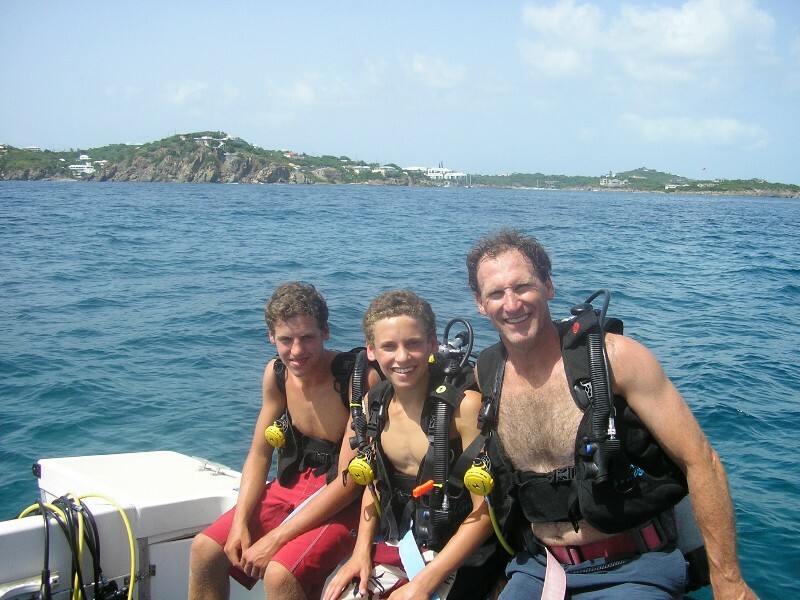 Dr. Less Burstein, from New York, and his two sons Brian and David are avid and accomplished divers. They visit the Ritz Carlton in St Thomas quite frequently. In the photo, the divers are waiting a little longer for darker conditions to set in before the making the splash. All the way from Chicago, pilot Thomas Crane flew his family in their own plane down to the Caribbean. They went Island hopping but they took a longer stay in Saint Thomas. Patagon staff had the privilege to work with them for their PADI advanced certification. 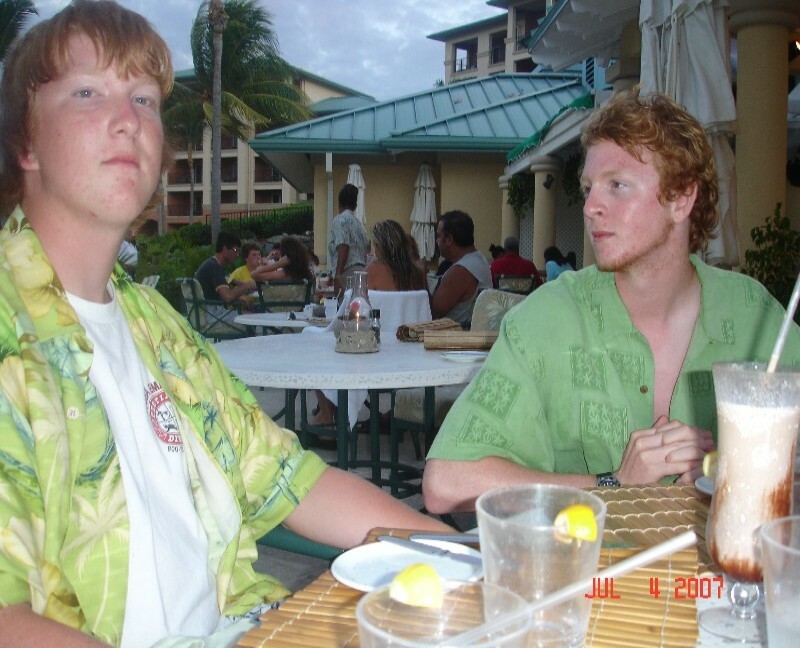 In the photo, Steven and Tyler, the two sons (they also have a younger daughter) of Thomas and Sally, are relaxing at The Ritz after a morning of diving. 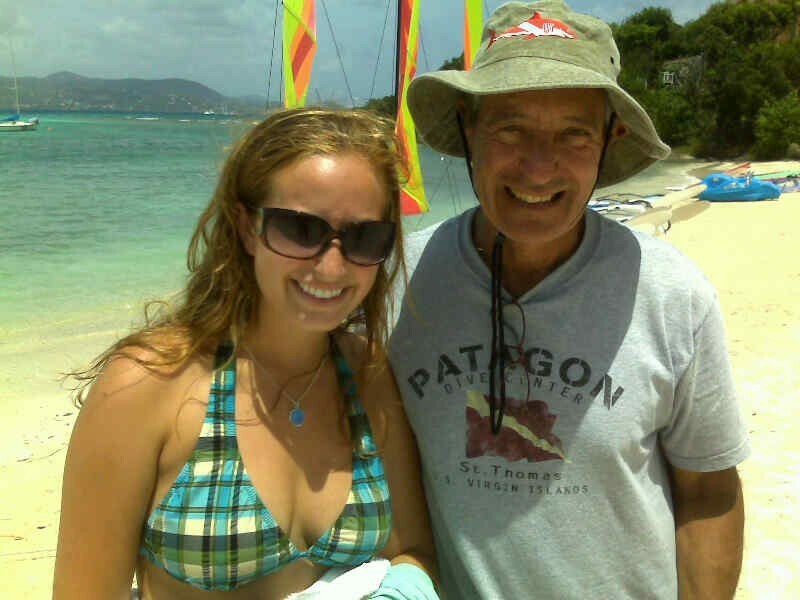 Dave and Bethany, from Phoenix, spent a long week end of diving at The Ritz in Saint Thomas. Dave is a physician and has lots of experience in dry suit cold water diving over the Pacific North West Coast and he wished that Bethany also took up on the sport. The Patagon Staff took them on a bunch of dives and Bethany got PADI certified as well. Bethany is a professional singer. Dave Moffett and his son Jay ready to take a plunge at "Strugglers", a site with granite underwater structures forming canyons, passages, and some narrow swim throughs. 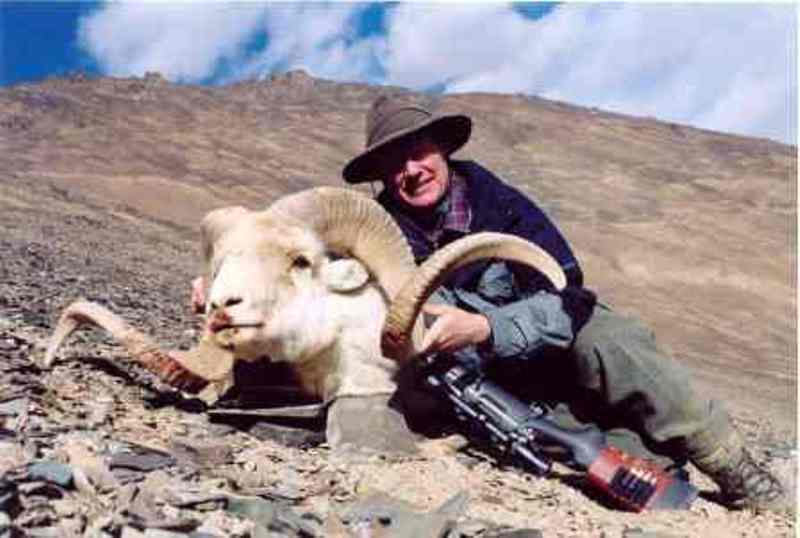 Dave, an early retiree from a very successfull banking career, spends much time in adventure travel. Most recently he made it to the top of Kilimanjaro. 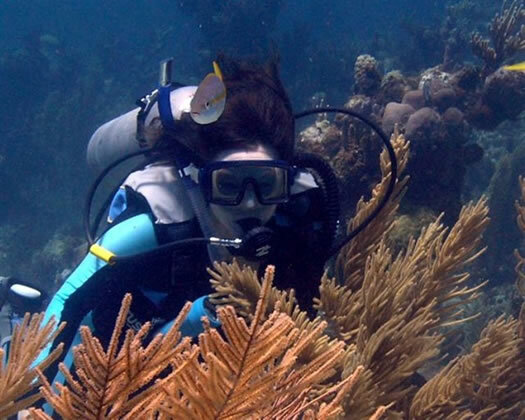 And for SCUBA diving, in 2007 he visited Bermuda, the Florida Cays, and St Thomas. 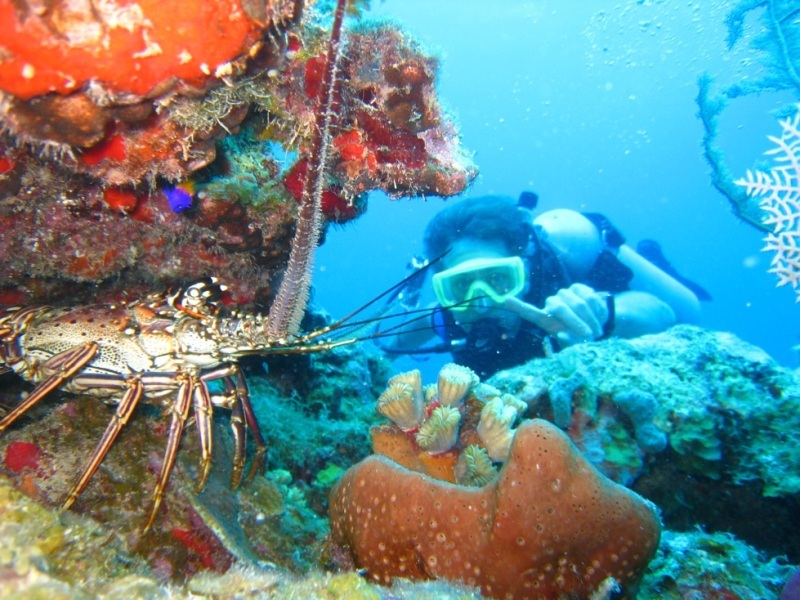 Dave did rated St Thomas diving the best of the three destinations. We look forward to see them again next year. .
David Joll is originally from England but he lives with his family in Bermuda. Certainly a very nice place to come back from his work related intense world travel. He and his son got PADI certified with Patagon Dive Center few years ago and we are so thrilled to see them coming back every year since. David is really a fun guy to be around. 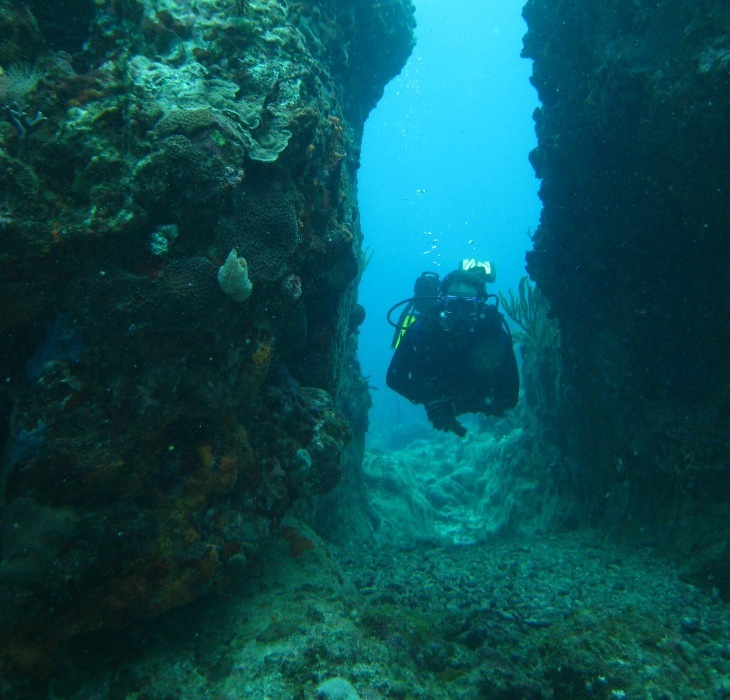 In the photo, David is negociating his rather corpulent body size inside one of the underwater caves of the dive site "The Cow". In the photo, aboard "Patago", David and Joi, are heading to dive sites over the South side (Caribbean side) of Saint Thomas. They stayed at The Ritz during the Summer of 2006 and went diving with Patagon daily. In the afternoons David also took daily one mile swims, in the waters of Great Bay, to keep on his triathlon form. 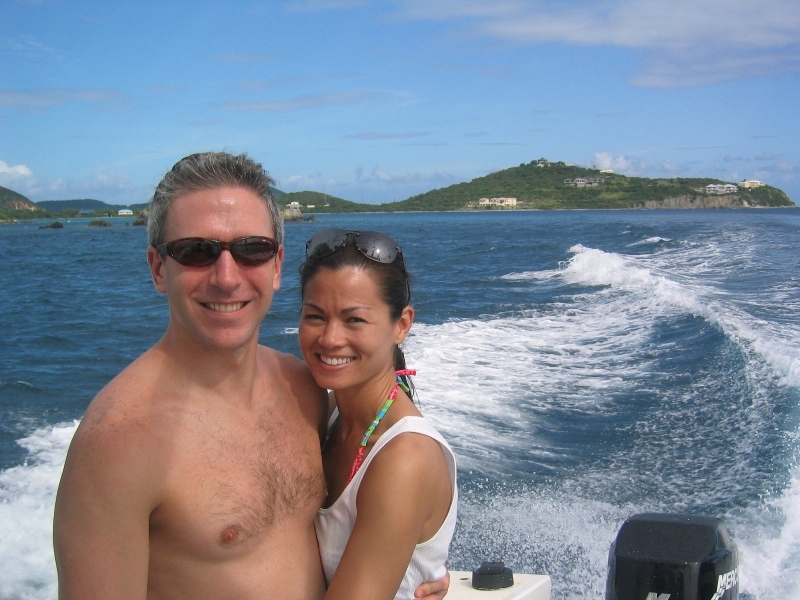 In 2008 David and Joi are back at The Ritz for their wedding and make time from that busy schedule to go diving!! Congratulations from the Patagon Team! 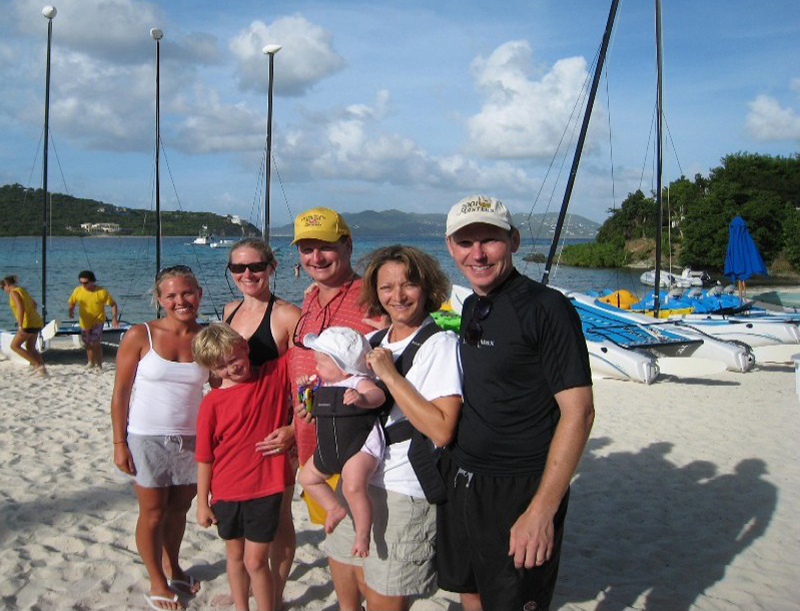 Dave, Dana and Stephany Ross are frequent visitors to The Ritz in St Thomas. 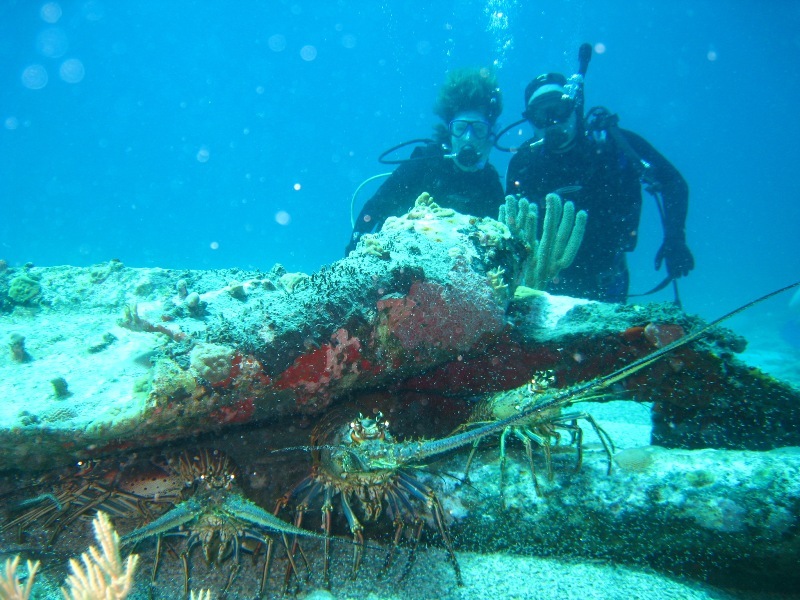 Over the years, they became avid divers and strong supporters of Patagon Dive Center. Dave is an eye doctor in Atlanta, Georgia and an excelent tennis player with a great looking back hand "a la Justine Hardene". Their daughter Stephany is a champion snow skier ranked number 7th. (in her age category) for the Nation Sky Slalom Competitions. 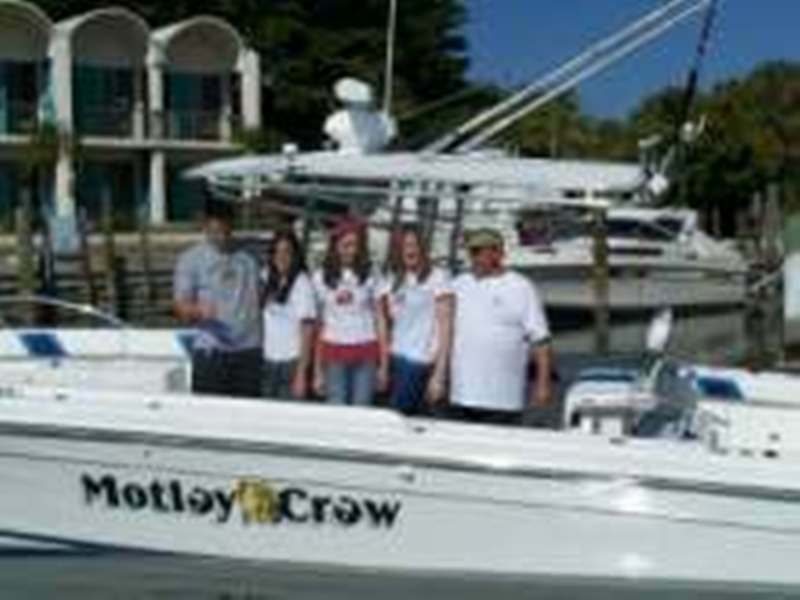 In the photo Dennis Lopez and his family aboard his high performance speed boat "Motley Crew". 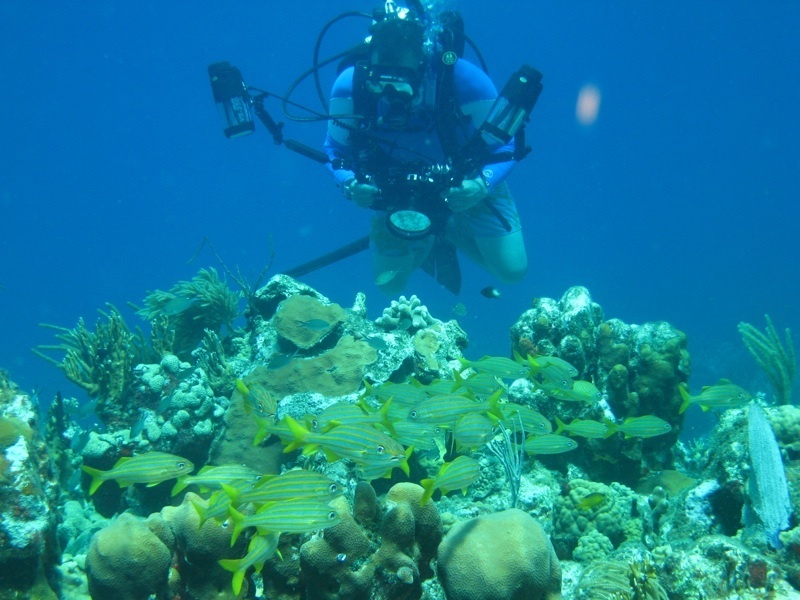 He is a lawyer from Tampa, Florida and a passionate diver. Regularly, he will take "Motley Crew" into the Gulf waters, 40 miles off shore in order to find some good diving conditions. Dennis' children are all divers. 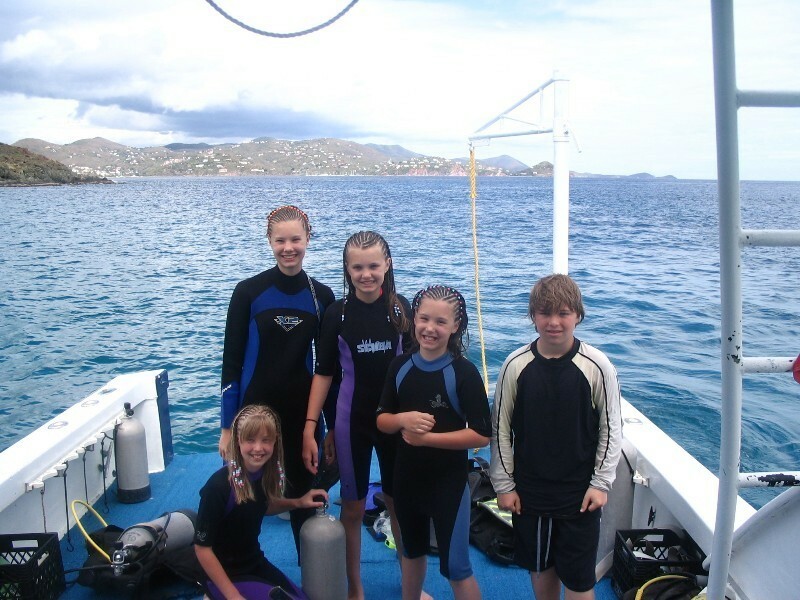 The family visits St Thomas often and put some dives with Patagon on every stay. 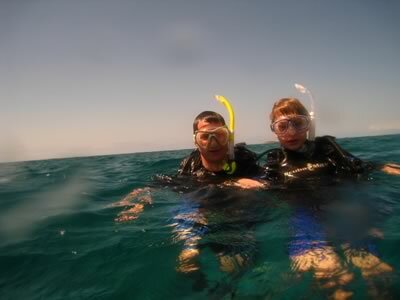 Weather conditions allowing, we also like to offer Dennis a couple of special dive sites during each stay. Yet, no need here to go 40 miles out! 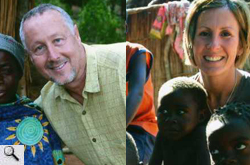 Dr. Gary Willen has his medical practice in Lake Taho, Northen California. 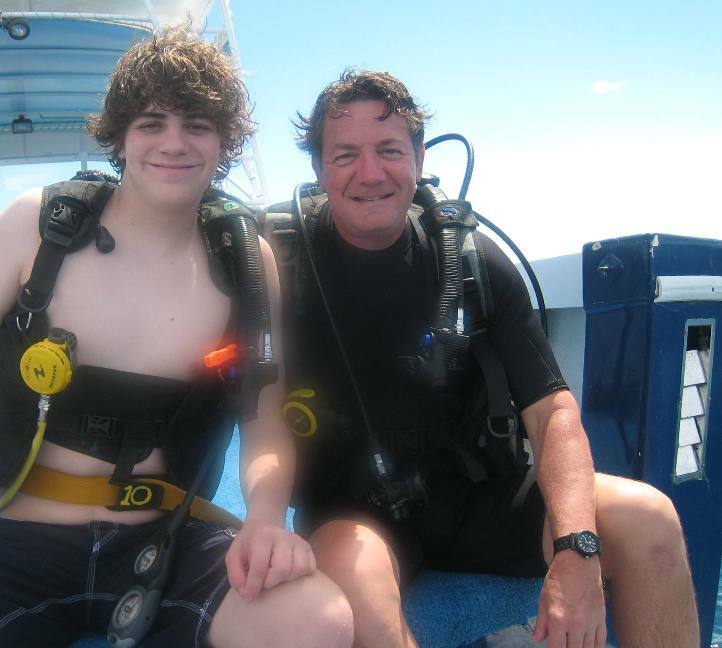 With his family they are regulars to The Ritz in St Thomas and Gary always put few days of diving with Patagon on every visit. 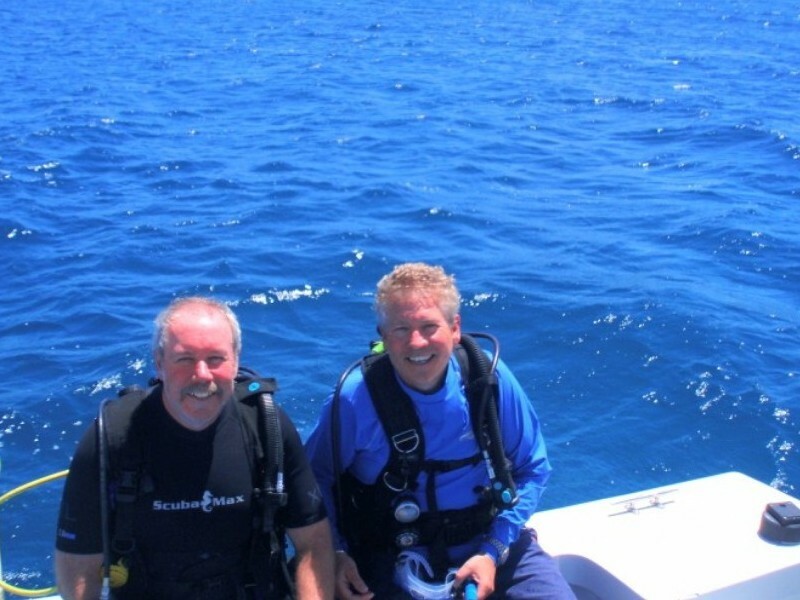 On the photo, just before a dive, Gary (on the right) with his all time friend Randy from Ohio. 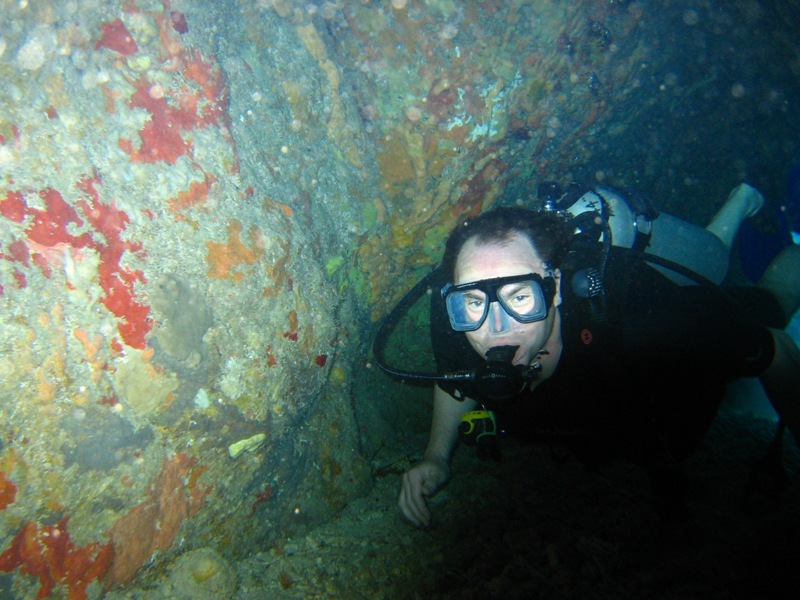 Randy also became an avid diver after getting PADI Open Water certified with Patagon. 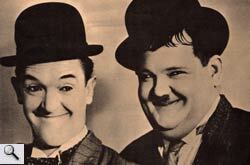 Thanks guys for your constant support and your always present good humor! 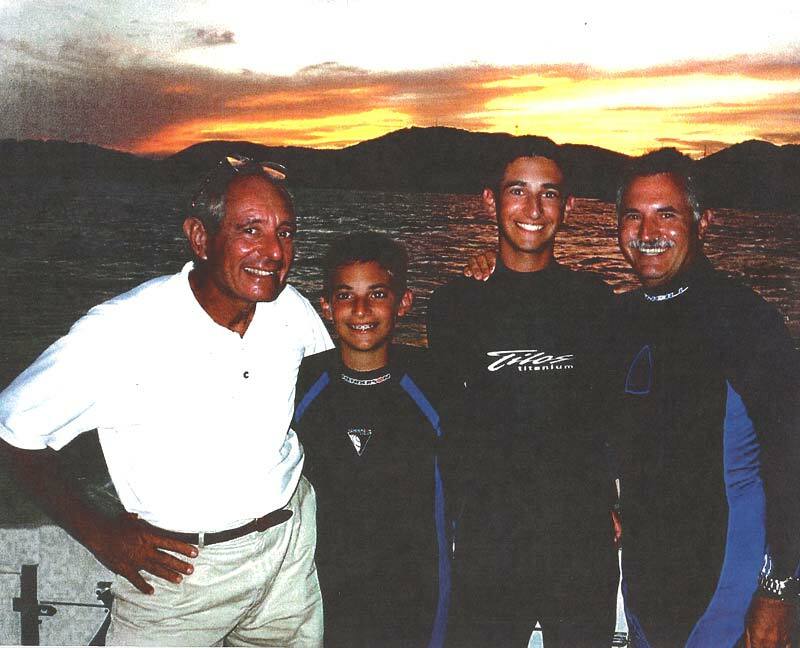 A surgeon from New York, Dr. Lyall Gorenstein with his two older boys just getting ready for a morning dive at the dive site "The Calf". 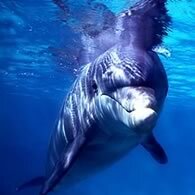 Next year, the younger brother will turn of "dive age" and be able to join in the dives.